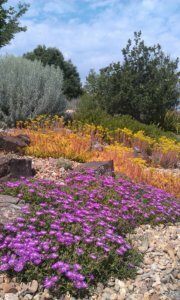 Colorado provides many challenges to the gardener. With our arid climate, high altitude and short growing season, selecting the right plants can be challenging. Beautiful as they may be, deer and elk provide yet another challenge to the high country gardener. Whether you intend on planting a small rock garden or an extensive landscape, you will most likely be visited by deer and/or elk who assume you’ve created a salad bar just for them. To help you, we have created two informative brochures that can help you select and care for your plants, trees and bushes. Displayed below are just a few examples of the many recommended plants for the high country gardener. While we cannot guarantee that they won’t become a mid-afternoon snack for the local herd, these plants are generally good choices.